I met John at a party two months ago. من جان را دو ماه پیش در یک پارتی ملاقات کردم. We're having a party this Saturday. Can you come? He's a member of the Labour Party. The main political parties in Britain are the Labour Party, the Conservative Party (also called the Tory Party) and the Liberal Democrats. In the US the main parties are the Republicans and the Democratics. We’re having a small party this evening to celebrate our wedding anniversary. The university threw a party to welcome them. I met John at a party a couple of months ago. I have always voted for the Labour Party. He failed to win the party’s nomination for President. There were several students in our party. A search party was sent out to look for the missing climbers. I was not a party to this discussion. ▪ have a party We’re having a party on Saturday night. ▪ hold a party The party was held at his flat. 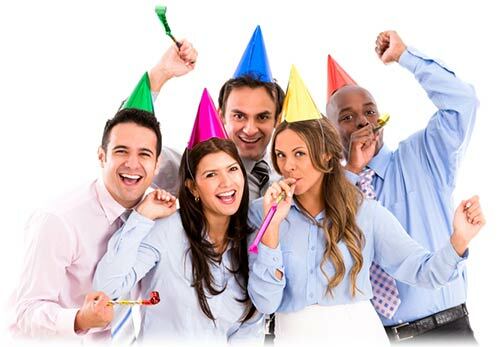 ▪ throw/give a party (=organize it) Staff threw a party to celebrate the news. ▪ host a party (=give a large or formal party) The party was hosted by the Danish ambassador. ▪ go to/come to a party (also attend a party formal) Are you going to Tom’s party? | About 500 people will attend a party in her honour. ▪ invite somebody to a party I’ve been invited to Greg’s party next weekend. ▪ gatecrash a party (=go to it even though you have not been invited) Some older boys tried to gatecrash the party. ▪ a party is in full swing (=people at a party are having a good time talking, dancing etc) At 3 am, the party was still in full swing. ▪ there is a party going on Somewhere near the hotel there was a party going on. ▪ a party breaks up (=it ends and people go home) The party broke up a little after midnight. ▪ a birthday party They met at her sister’s 18th birthday party. ▪ a Christmas/Halloween etc party I hope you’re going to the office Christmas party. ▪ a big/small party I don’t really like going to big parties. ▪ a dinner party (=one where people are invited to someone’s house for an evening meal) It’s a favorite topic of conversation at fashionable dinner parties these days. ▪ a cocktail party (=a fairly formal party, at which alcoholic drinks are served) I first met him at a cocktail party at the American embassy. ▪ a fancy dress party British English, a costume party American English (=one where people wear unusual clothes, for example so they look like someone from a story) She went to the fancy dress party as Snow White. ▪ an office party I danced with my boss at the office party. ▪ a surprise party Amy has planned a surprise party for his birthday. ▪ a farewell/leaving party You didn’t come to Ken’s farewell party, did you? ▪ a street party (=one held outside in a street) Thousands flocked to the street party on Princess Street to celebrate New Year. ▪ a lavish party (=one where a lot of money has been spent) He threw lavish parties for his celebrity friends. ▪ the party spirit (=the way people feel when they are really enjoying a party) There’ll be plenty of free champagne to get the party spirit going. ▪ be in a party mood (=want to enjoy yourself at a party) Kate wasn’t really in a party mood, so she stayed home. ▪ party games The children had great fun playing party games. ▪ a party dress The little girls were wearing white party dresses. ► Do not say 'make a party' or 'do a party'. Say have a party. ▪ a political party The Labour Party and the Conservative Party are the two main political parties in Britain. ▪ the Labour/Democratic etc Party The leadership race within the Republican Party is almost over. ▪ an opposition party (=a party that is not in power) The tax increase was criticized by opposition parties. ▪ the ruling party (=the party in power) The ruling party’s level of support grew throughout the year. ▪ a right-wing/left-wing party Support for the right-wing parties was strongest among young working-class men. ▪ a party member He’s been a Conservative party member for 20 years. ▪ the party leader He met with opposition party leaders. ▪ a party candidate (=someone who represents a political party in an election) The seat was won by the Socialist Party candidate with 68% of the vote. ▪ the party faithful (=strong supporters of a party) His policies appeal to the party faithful. ▪ a party activist (=someone who works hard for a party) Campaign literature is distributed by unpaid party activists. ▪ party policy (=a political party’s official plan or position on important subjects) There has been a change in party policy. ▪ a party conference He will give a speech at the Tory party conference this morning. ▪ the party chairman British English He resigned as Conservative party chairman. ▪ a party official The incident has angered senior party officials. ▪ a party wins/loses an election Do you think the Labour Party can win the next election? ▪ join a party Bloomfield joined the Communist Party in 1946. ▪ form/found a party The two politicians broke away from the PDF to form a new political party. ▪ a party is in power From 1945 until 1951 the Labour Party was in power in Britain. ▪ a party comes to power (=begins to be the government) The ruling party came to power in May 2001. ▪ party a social event when a lot of people meet together to enjoy themselves by eating, drinking, dancing etc: We’re having a party for Sarah’s 40th birthday. | I met my boyfriend at a party. ▪ get-together an informal party: Christmas is the perfect time for a family get-together. ▪ reception a large formal party, especially one after a wedding or to welcome an important person: The wedding reception is at a nearby hotel. | a reception for the Thai Foreign Minister | They attended a White House reception to mark the Queen’s visit. ▪ function a large formal or official party: He has been asked to play at many corporate functions (=an official party held by a company). ▪ celebration a party or special event that is organized in order to celebrate something: the country’s 50th anniversary celebrations | It was a 21st birthday celebration which Mary would never forget. ▪ do British English informal a party: We’re having a do to celebrate Margaret’s birthday. ▪ dinner party a party where people are invited to someone’s house for an evening meal: I met him at a dinner party. ▪ house-warming (party) a party that you have when you move into a new house: We’re having a house-warming next week. • She belongs to the Labour Party. • Did you go to the party? • The school is taking a party of 40 children to France. • The theatre gives a 10% discount to parties of more than ten. • The contract can be terminated by either party with three months' notice. • The judge's decision satisfied most of the parties concerned. Middle English (denoting a body of people united in opposition to others, also in sense 1): from Old French partie, based on Latin partiri ‘divide into parts’. Sense 2 dates from the early 18th cent. • They threw a huge party to celebrate the end of term. • By now the party was in full swing. • First we must notify all the interested parties. • From 1991 new political parties emerged to challenge the governing party. • He loves throwing lavish parties. • He was accused of having strong links with the Communist Party. • I was at a party in London that night. • I'm organizing a surprise party for my sister. • It was time for us to join the coach party. • Most MPs will follow the party line. • Mr Cameron was cheered by the party faithful. • On moving in they threw a huge house-warming party. • She arrived with a party of helpers. • She became the leader of the party in 2008. • She is a hard-drinking, non-stop party girl. • She left the party in 2000. • She refused to follow the party line= the official view of the party. • She turned up at her fiancé's bachelor party. • The Labour Party was returned to power in 2001. • The Labour party lost the vote on this important issue. • The Liberal party controlled the Senate at this time. • The captain told the crew to prepare to receive a boarding party. • The girls were having a slumber party. • The party broke up around midnight. • The party was officially dissolved in 1927. • The wedding party climbed into the carriages. • There was a party going on next door. • They are now the majority party in Parliament. • They attended the launch party for the new film. • This agreement binds both parties. • This agreement is binding on both parties. • This agreement shall be binding upon both parties. • We had a farewell party for Michelle when she left the company. • A rescue party immediately set off by boat. • Did you go to their party? • He gave a dinner party for some old friends. • It was decided to send out a search party to look for the missing climbers. • Several members of the England cricket touring party were robbed outside the team hotel. • The theatre gives a 10% discount to parties of more than 10. • There were fizzy drinks, cake and party games. • They threw a party to celebrate the end of term. • We're going to have a housewarming party next weekend. • That guy Jake— he really knows how to party! The party has/have just elected a new leader. He was elected as party leader in 2001. They contacted party members from across the nation to ask for their support. Most museums give a discount to school parties. The UN called on all parties in the conflict to take a positive stance towards the new peace initiative. It's often difficult to establish who the guilty party is following a road accident. 1) N-COUNT A party is a political organization whose members have similar aims and beliefs. Usually the organization tries to get its members elected to the government of a country. ...a member of the Labour party. ...her resignation as party leader. 2) N-COUNT A party is a social event, often in someone's home, at which people enjoy themselves doing things such as eating, drinking, dancing, talking, or playing games. Most teenagers like to go to parties. 4) N-COUNT: usu with supp A party of people is a group of people who are doing something together, for example travelling together. ...a research party of scientists. ...a court, the decision of which may not satisfy either party. 6) PHRASE: V inflects, PHR n Someone who is a party to or is party to an action or agreement is involved in it, and therefore partly responsible for it. Crook had resigned his post rather than be party to such treachery. • We are having/giving/throwing a party. • Were you invited to her party? • Our New Year's Eve party was a huge success. • Get in the party spirit. • I'm not in a party mood. • The senator is loyal to his party. • The parties in the lawsuit reached a settlement. • The principal of the school was urged to be a party [=participant] in the educational council. • Interested parties are asked to contact their local representative. • He refused to be a party to [=he refused to take part in] the gambling ring. • A party of teenagers is in charge of the neighborhood cleanup.